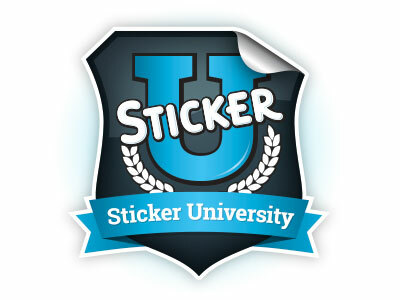 Welcome to Sticker University aka, StickerU! If it’s your first time here keep reading because we’re sure you are going to love this new addition to StickerYou! StickerU is a learning and resource center designed for anyone that wants to learn more about our products. Whether you have a question about what type of decal to order or whether or not your custom stickers can survive a thunderstorm, StickerU will have the answers you are looking for. Brenda and Gary explain and demonstrate how white vinyl stickers stay stuck to surfaces. Not even their bad jokes or bad hairstyles will make these stickers peel. Brenda works out her frustration with her husband on some custom floor decals, putting the material to the test with her sweet dance moves -check out this durability! Gary explains the sticky science behind sticker adhesion and how white vinyl labels stay stuck in cold or wet conditions. But can stickers stay stuck to Brenda's frigid heart? Brenda and Gary shake their stuff on the catwalk, showing off their stylish custom iron-on transfers. As you'll see, these iron-ons are high quality, durable...and flexible. Brenda and Gary show off the many uses of clear vinyl stickers. Clear vinyl stickers can stand up to Gary's water gun, but can they stand up to his bad breathe?